Fox and BDS joined forces to custom valve each application to work perfectly with each BDS Suspension system. 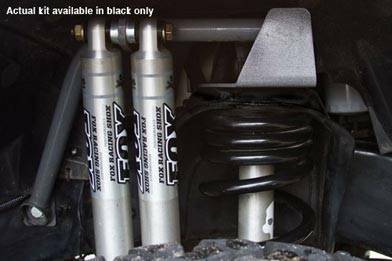 The basic shock design is based on Fox Racing Shox race products, but re-designed to turn your BDS equipped truck or Jeep into an offroad machine.Cold-forged, metal-impacted 6061 T6 aluminum shock body dissipates heat three times faster than a conventional steel body shock. The 2.0 Performance Series shock runs as cool as a 2.5 diameter shock on the same application. FOX Racing Shox formulated race shock oil developed for ultimate performance at variable temperatures.